INDUSTRY.co.id - Jakarta - Samsung Electronics Indonesia officially launches the Samsung Galaxy Note9 for consumers in Indonesia. The Galaxy Note series has been known as a smartphone pioneer with the support of S Pen, and now the Samsung Galaxy Note9 continues its innovation into a Super Powerful Note with All Day Battery, greater storage and RAM, S Pen. 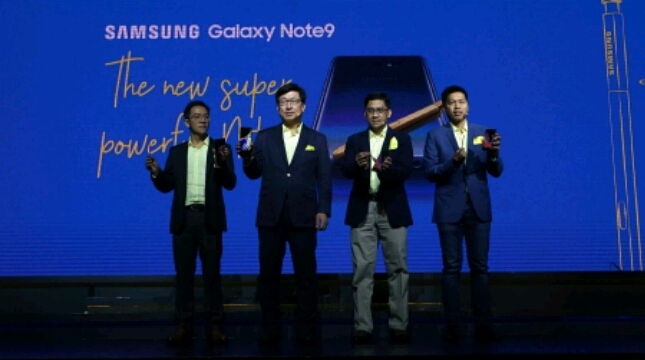 "The combination of performance, strength and intelligence complements the Galaxy Note9 as the only smartphone that has innovation to support users with the variety of activities they have," said Jaehoon Kwon, President of Samsung Electronics Indonesia. All Day Battery support with a capacity of 4,000mAh has a battery life that is strengthened with the Exynos 9810 processor. Understanding the high activity of users, Samsung complements the Galaxy Note9 with a cooling system that is embedded to help processor functions work at an optimal level so that Galaxy Note9 works with smooth even when heavy use. S Pen has evolved to support unlimited productivity, which originally only used as a tool for writing and drawing, now Samsung gives more control to Note lovers by immersing the latest innovations in S Pen. With the support of Bluetooth Low-Energy (BLE), S Pen Galaxy Note9 can function as a remote control so that it can be used as a clicker for presentations, photo and video playback or for taking photos. And it only takes about 40 seconds to charge the S Pen to full, to be used up to 30 minutes or 200 clicks. Productivity becomes limitless because the Galaxy Note9 also presents a PC-like experience using Samsung DeX. Users can make presentations, edit photos, and watch their favorite shows with the support of this smartphone, just by using an HDMI3 adapter that is easy to carry. When connected to a monitor, the Galaxy Note9 can be virtual desktop and even functions as a fully functional second screen. Make notes with S Pen while watching videos, or use the Galaxy Note9 as a trackpad, to right-click, drag and drop, and use a multiple screen on a monitor. Galaxy Note9 has Intelligent Camera technology, which has maximized AI to take photos like professionals. Scene Optimizer is able to identify photo elements, such as scenes and subjects, and classify them automatically into one to 20 categories, and automatically optimize by category. The latest Flaw Detection feature can inform users if something is not appropriate. Notifications will immediately appear when the photo is blurred, the subject of the photo is blinking, the lens is dirty, or the backlight can affect the quality of the photo. The rear camera of the Galaxy Note9 is equipped with Dual Aperture F1.5 / F2.4, Super Speed ​​Dual Pixel, HDR, Live Focus and Super Slow-mo that has been updated with the ability to select the desired part in super slow-mo video and choose duration of 2 or 4 seconds. The advantage of recording images in low light conditions is also the front camera of the Galaxy Note9 with F1.7 aperture. Powerful Entertainment in Your Hands Infinity Display is Samsung's signature design, and the Galaxy Note9 has the biggest edge-to-edge screen on the Galaxy Note series. 6.4-inch Infinity Display screens on the Galaxy Note9 with 3K screen technology (2960x1440) Quad HD + Super AMOLED, providing the best multimedia experience without limits. Based on the Display Mate4 review, the quality of the Galaxy Note9 screen produces brightness 27% brighter than the previous Note, and displays a 32% higher contrast level in bright ambient light. Coupled with immersive stereo speakers, the Galaxy Note9 is the ideal gaming smartphone. Exclusive, Fortnite games will be available for Galaxy Note9. Through the support of 6GB RAM capacity and 8GB RAM and a powerful processor, playing games without lag is no longer a problem. The Galaxy Note9 is equipped with AKG-designed stereo speakers, and is able to produce the best audio quality Dolby Atmos® to deliver a true sound experience. With an internal storage capacity of 128GB or 512GB, and the ability to add memory with microSD up to 512GB, Galaxy Note9 users can enjoy a capacity of up to 1TB for storage. Jo Semidang, IM Marketing Director of Samsung Electronics Indonesia, said, to serve consumers who have not received the Galaxy Note9 at the time of Pre Order, it held a consumer launch simultaneously in 4 locations in 3 cities. "That is Jakarta in Central Park and Kota Kasablanka, Surabaya Pakuwon Supermall and Medan Sun Plaza on August 24 to 26 2018," he said. Samsung Galaxy Note will be available in Midnight Black, Metallic Copper colors with the same S Pen color, and Ocean Blue with Yellow S Pen on Consumer Launch will be offered at a price of Rp. 13,499,000 (128GB / 6RAM) and Rp. 17,999,000 (512GB / 8RAM).